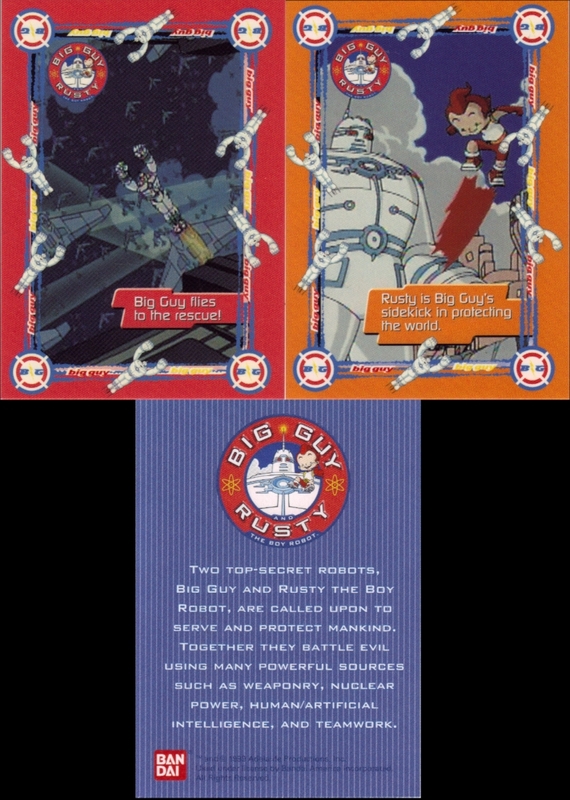 Big Guy and Rusty the Boy Robot is a cartoon based on the 1995 comic of the same name. What many people don’t realize is that there was a toy line for the cartoon during the time it aired on Fox Kids (1999-2001). 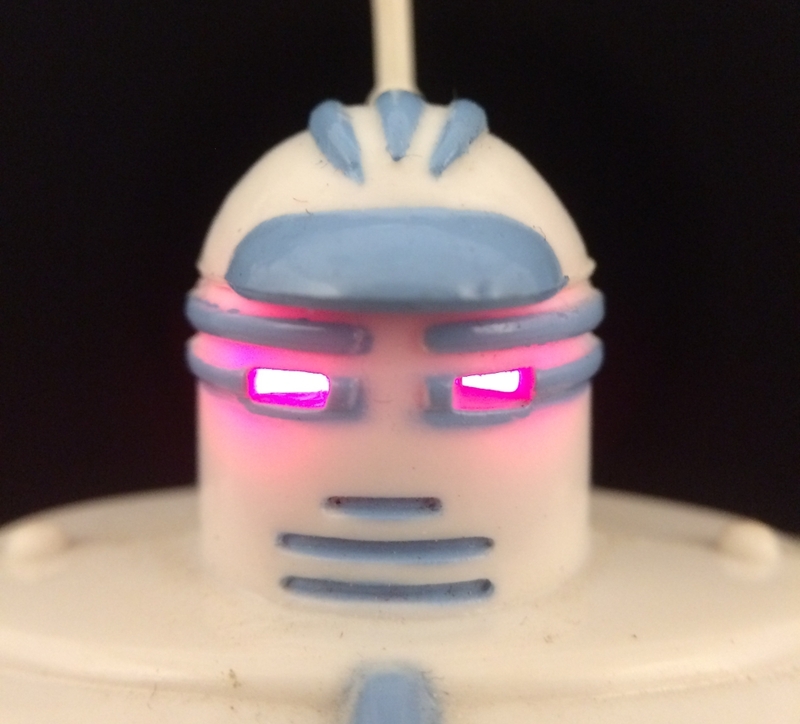 Join me as we look back at the Bandai toyline and a surprise bonus. 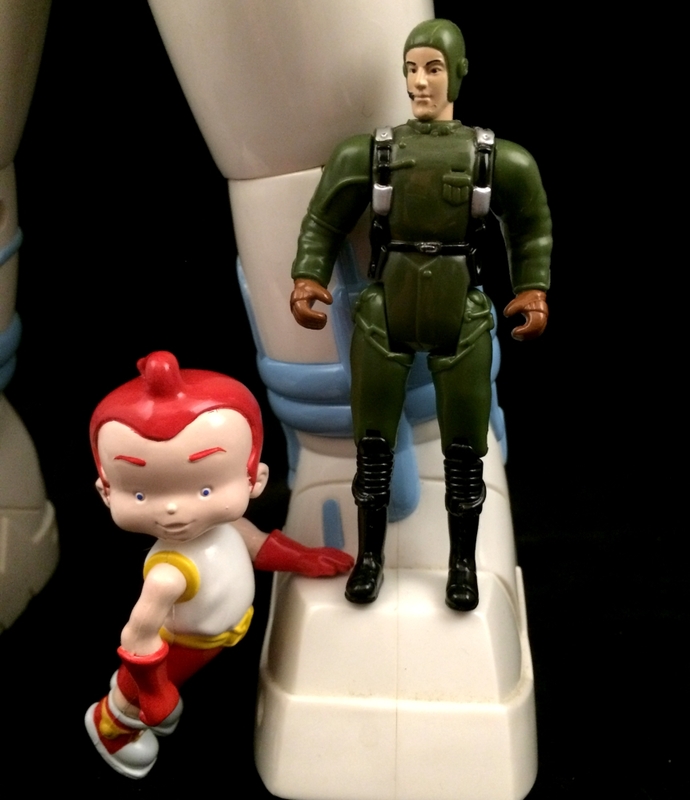 The Bandai toyline consists of only three items. Talking Big Guy, Flying Big Guy and Deluxe Big guy. 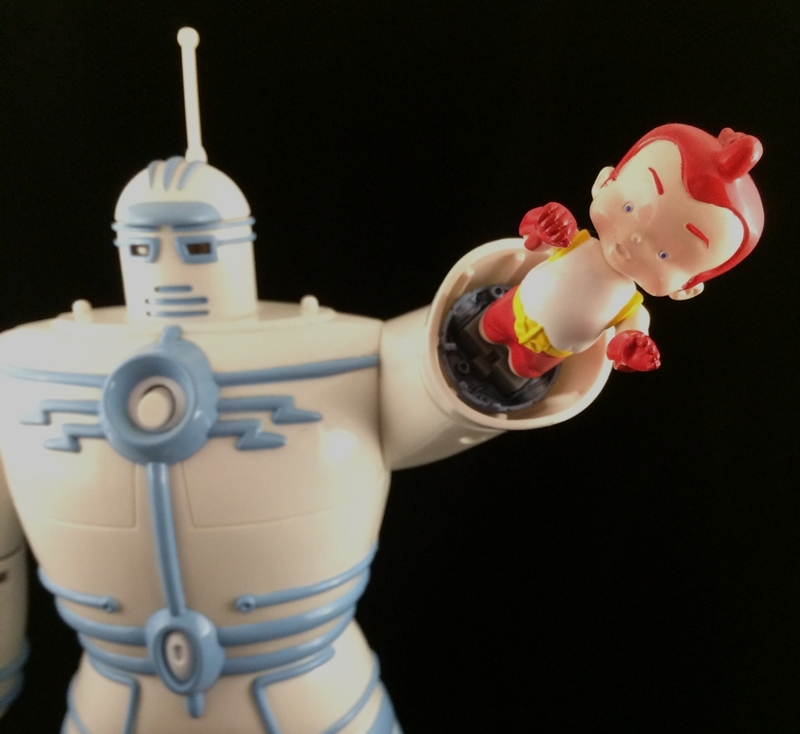 Both Talking and Flying Big guy figures were seven inches tall. They were blister carded on generic backer cards showing off all of the other 7″ figures in the line. 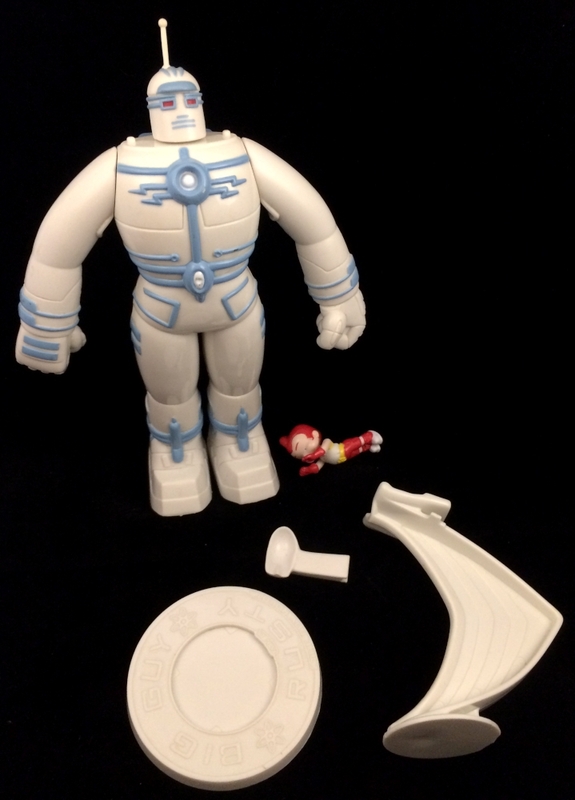 This would be a good time to mention that unfortunately, there is another toy pictured on the back of ALL of the packaging that was never released. 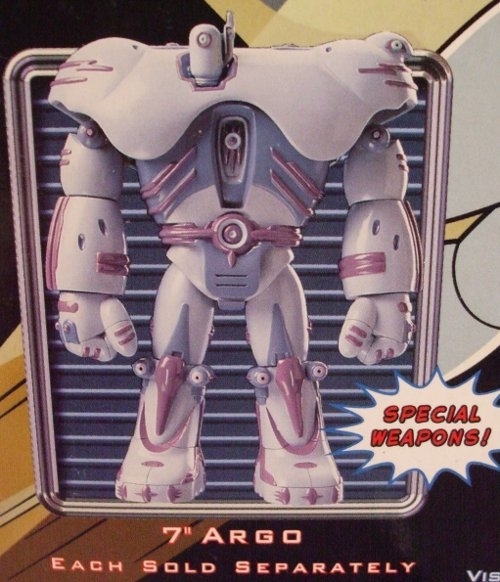 That figure would’ve been the only enemy character for Big Guy to fight, Argo! I don’t know why Argo was never made, but based on the single picture, he would’ve been a cool looking figure. 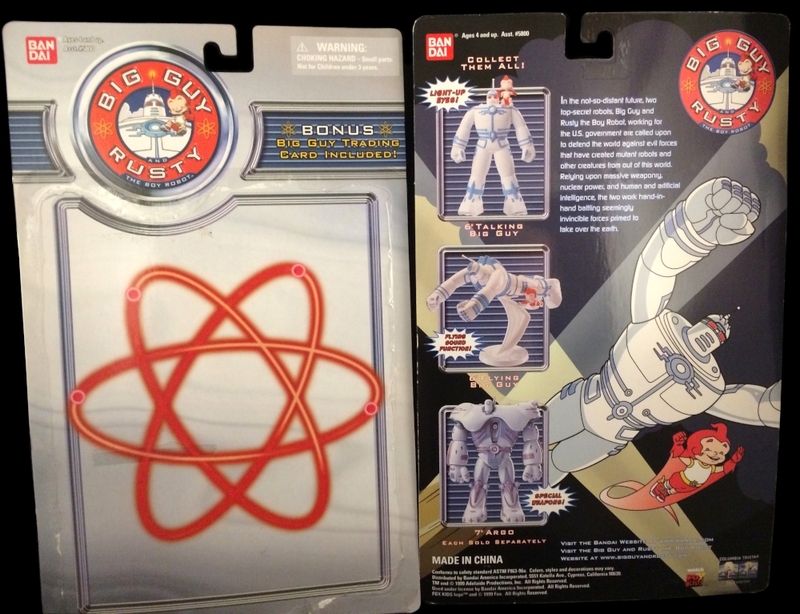 Both of the 7″ Big Guys also came with a trading card. While we have reduced the size of our pictures, it should be noted that the pixelation you see in the artwork is actually in the card as well. In fact, there is even pixelation on the artwork for the official DVD release so this seems to be a common issue with Big Guy & Rusty merchandise. The back of the trading cards are the same. 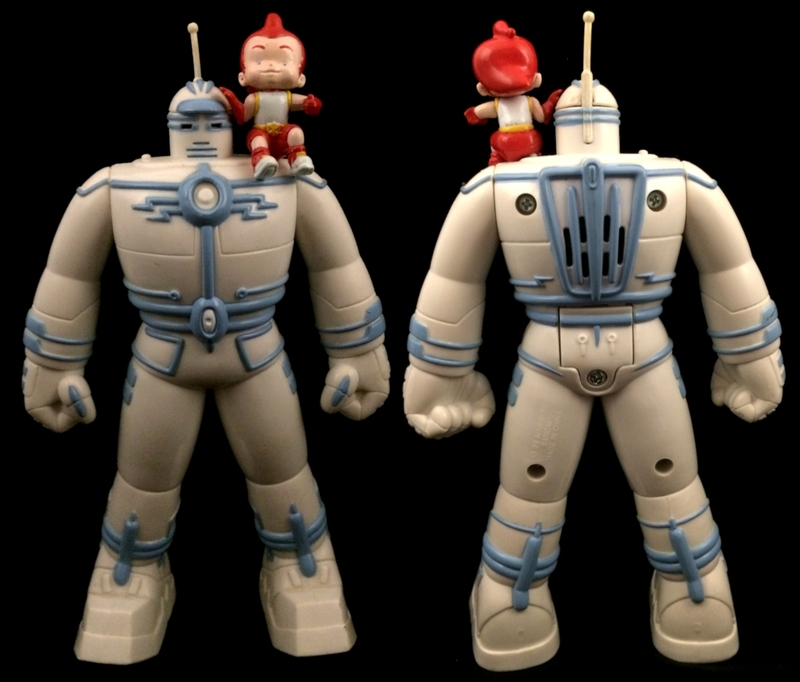 Getting back to the toys, Talking Big Guy comes with a Rusty figure that can sit on his shoulder. Rusty has limited articulation. His head can swivel along with his left arm. He has a hole on his underside to allow him to sit on the shoulder bolt on Big Guy. The balancing is a little tricky but he can sit up there. He will fall off very easily though. 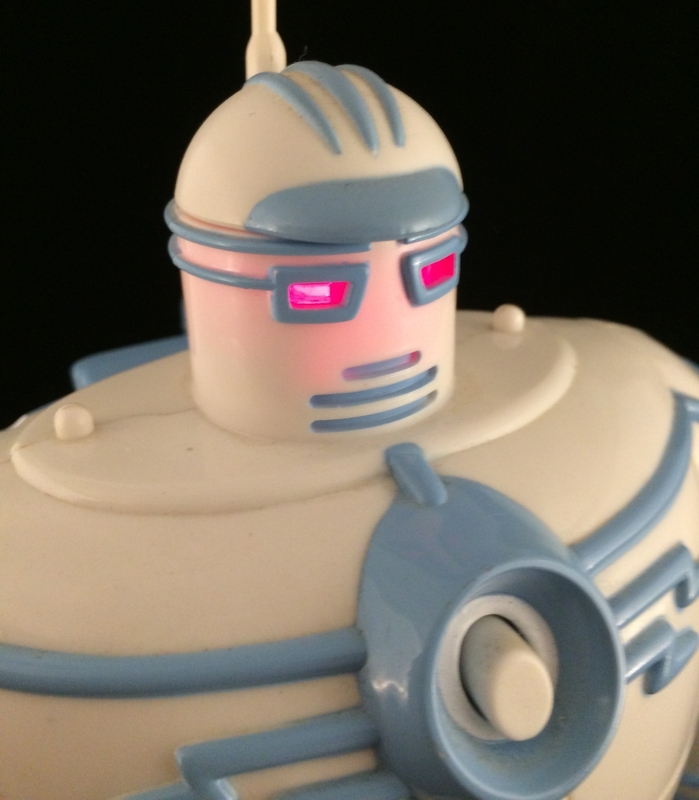 The button sculpted into Big Guy’s chest decoration activates his light up eyes and one of two voice clips. Big Guy can either say “All systems at Maximum” or “Deploy!”. There is a battery cover on Big Guy’s rear that takes two A76 batteries. Big Guy has rotating shoulders, wrists and knees. The leg articulation doesn’t do much to enhance the figure, but the arms work nicely. Thankfully Flying Big Guy comes with a three part flight stand. He also comes with a tiny Rusty in flight mode. The flight stand is made to hold Big Guy & Rusty so they can fly next to each other. The stand is well made and both figures fit great, but I think it would’ve been better if it was clear instead of white plastic. 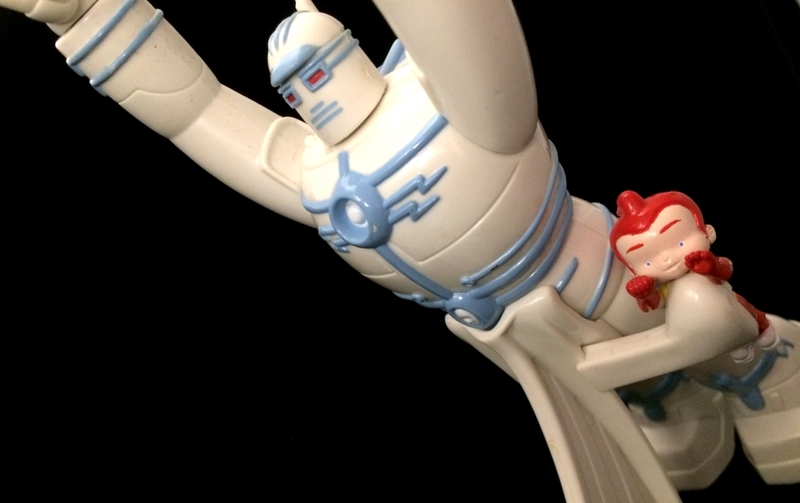 Flying Big Guy has the same articulation as Talking Big Guy, but less reason for it. To be honest, making the wrists rotate was probably all it needed. 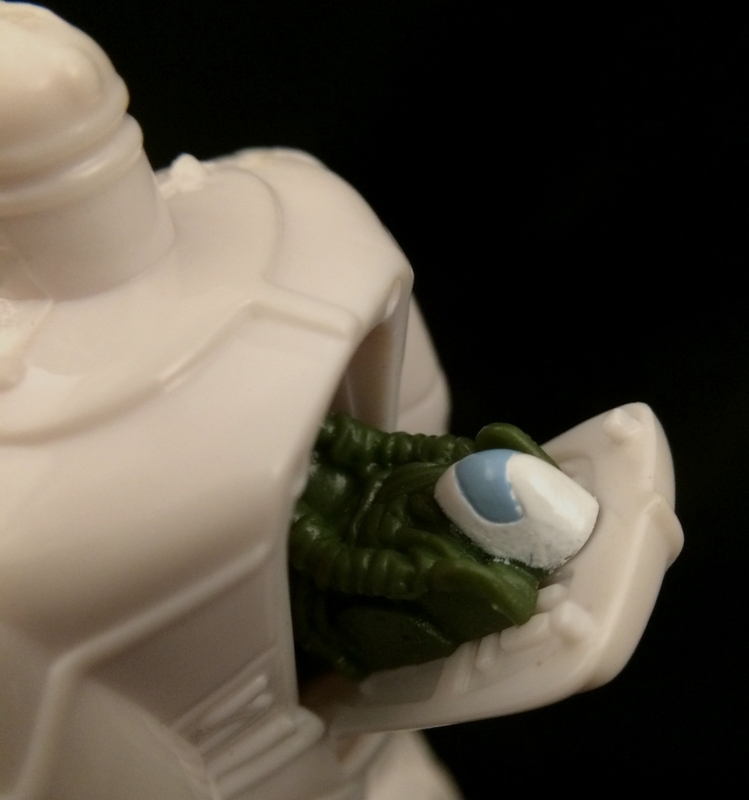 The head can also rotate slightly (unlike the Talking version). Flying Rusty can swivel his head back and forth. This now brings us to the large, Deluxe Big Guy. 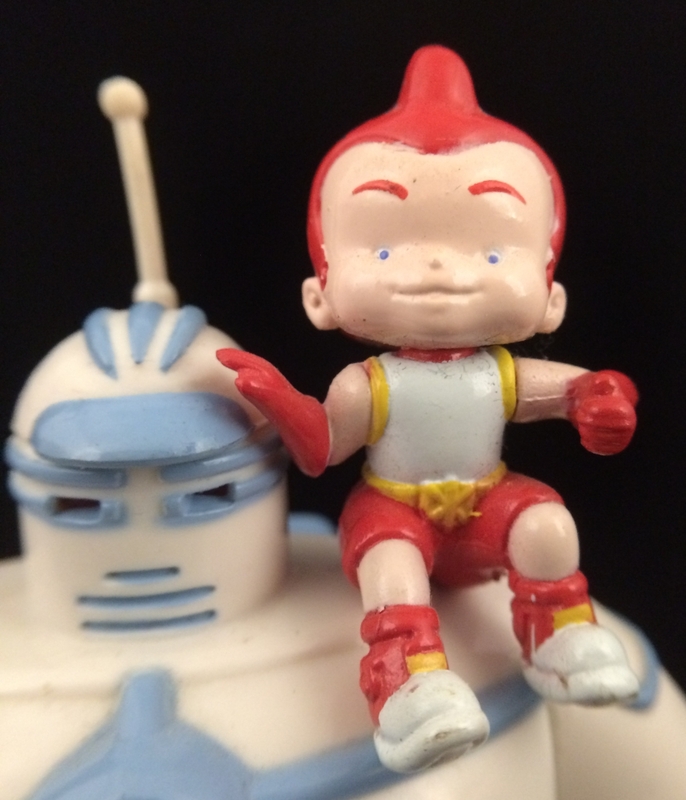 This figure was boxed, had four phrases from the show, light up eyes and all sorts of features that were showcased daily in the cartoon. 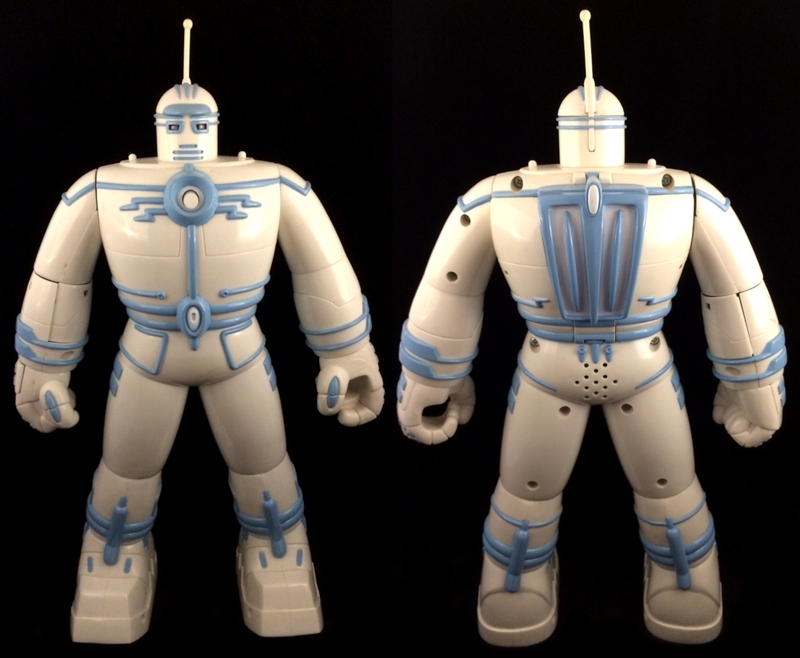 Deluxe Big Guy stands a whopping 12 inches tall. Like all of the Bandai Big Guy figures, he looks very show accurate. 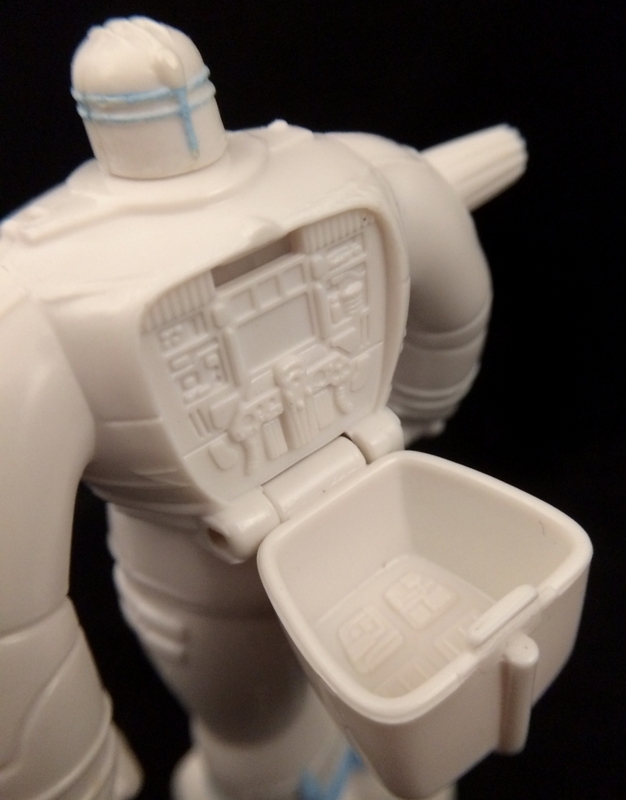 He also sports a button on the center chest detail to turn on the electronics. Both Arms, Wrists & Knees rotate like the other figures. 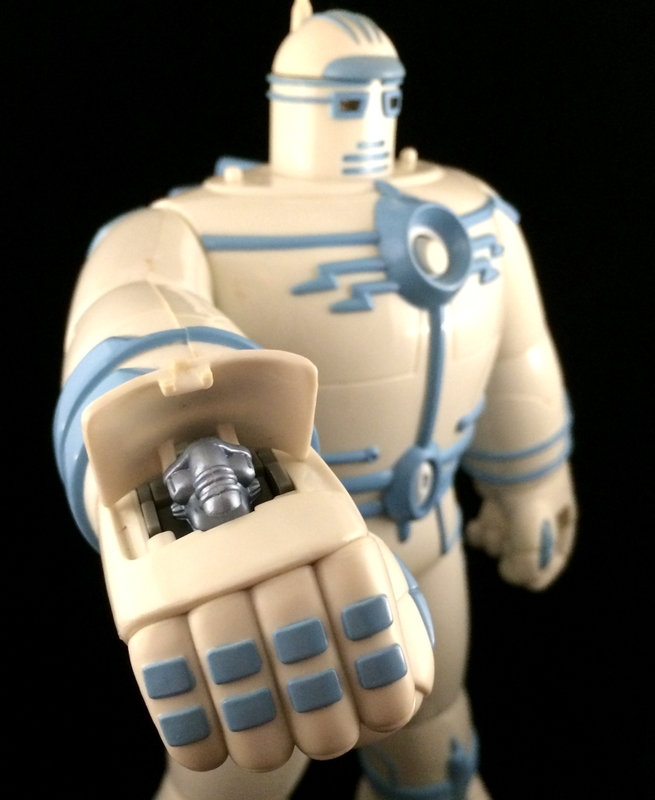 The left arm has an added point of articulation with a rotating lower arm. Big Guy’s arsenal includes a hand held ray gun. The gun fits easily in his left hand that’s sculpted to hold it. The back of the right hand has a pop up panel with a laser hidden underneath. This was used in the cartoon a lot of times. I don’t remember the hand held ray gun ever showing up in the cartoon. 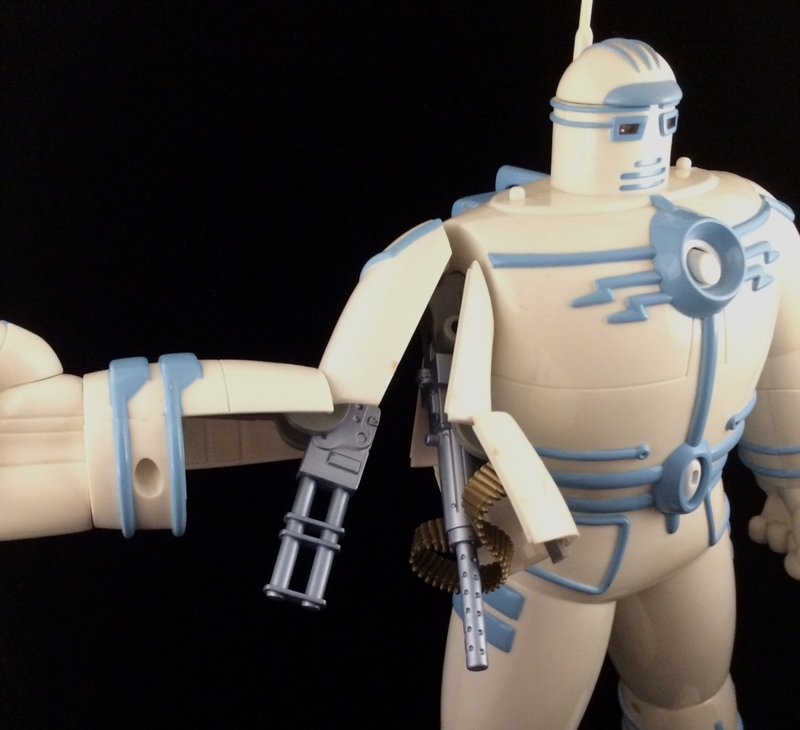 The left arm can separate for the pop out heavy guns. Even with this feature, the left arm can also rotate up and down. While this was also seen in the cartoon a lot, it was engineered differently. I like the cartoon way better where the arms would split at the X-Axis instead of the Y-Axis seen on the toy. 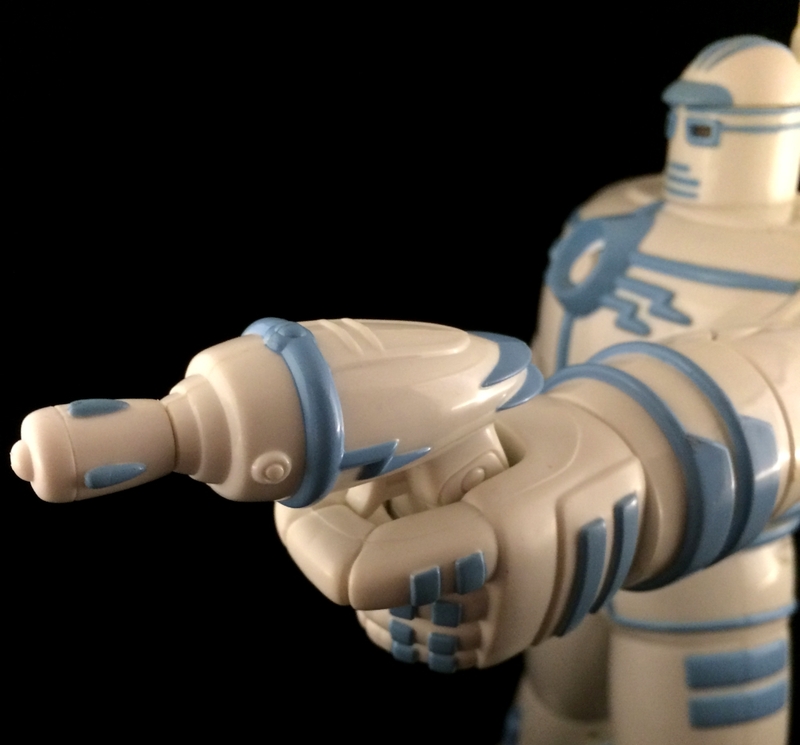 Both arms and wrists can rotate much like the 7″ figures. 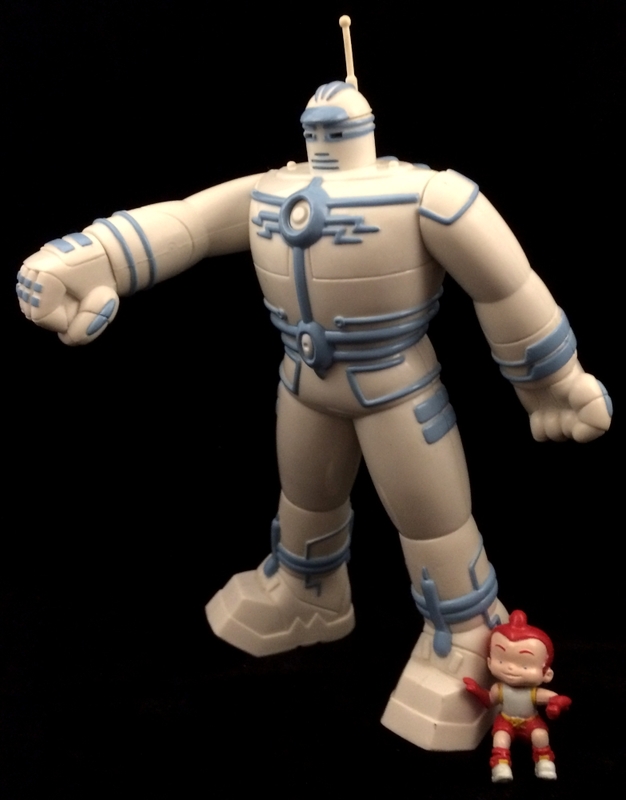 Included with Big Guy is a Rusty figure and a Lt. Dwayne Hunter figure. Rusty can rotate his arms and head. 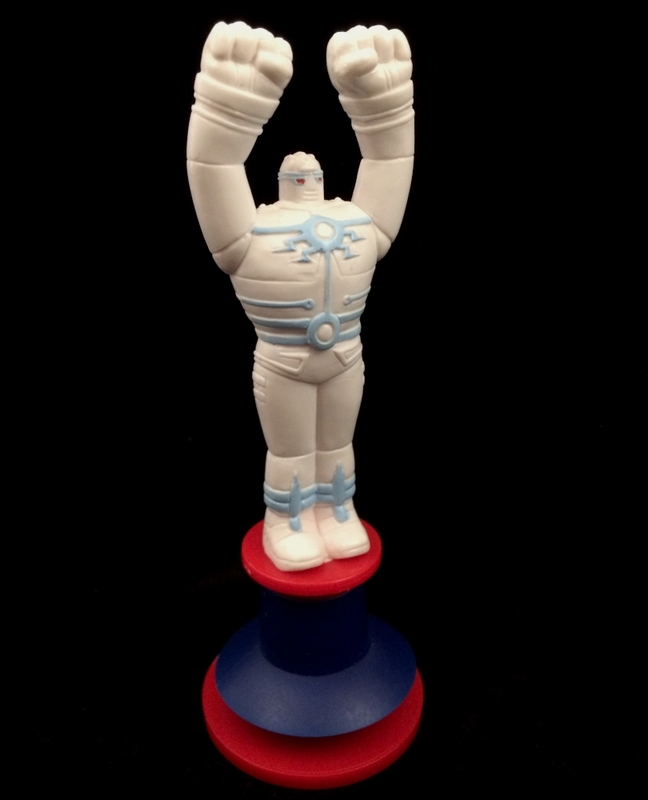 Dwayne can rotate his arms, hips and head. His knees can also bend. Rusty also holds a secret, he can plug into the Big Guy’s arm! 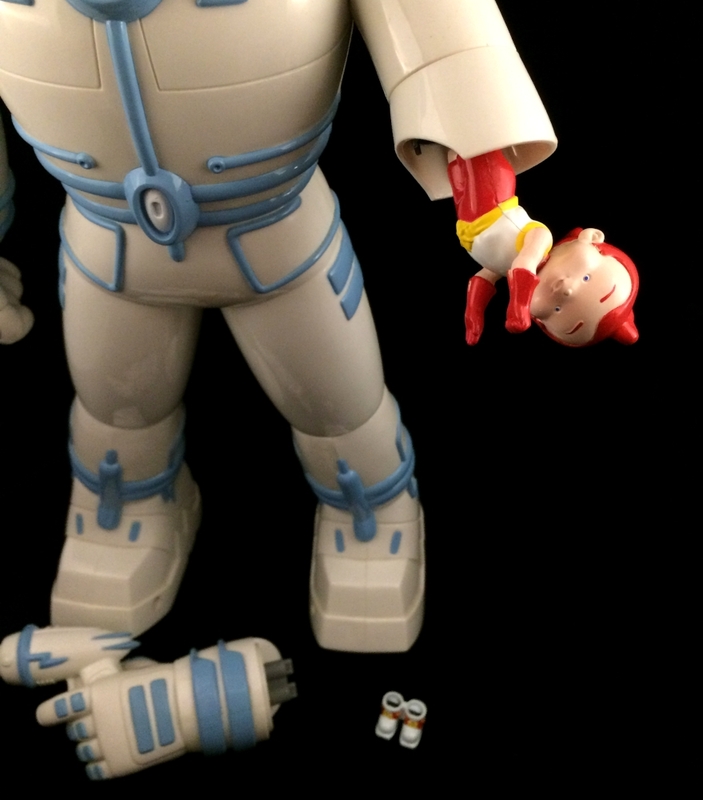 The left arm can be unplugged and if you take Rusty’s feet off, he has the same connector port as the hand. This can recreate a scene from the first cartoon episode. Just like in the cartoon, Lt. Dwayne Hunter can pilot the Big Guy. The back opens up to reveal a full cockpit. Surprisingly, the opening cockpit is very close to how it opens in the cartoon as well. 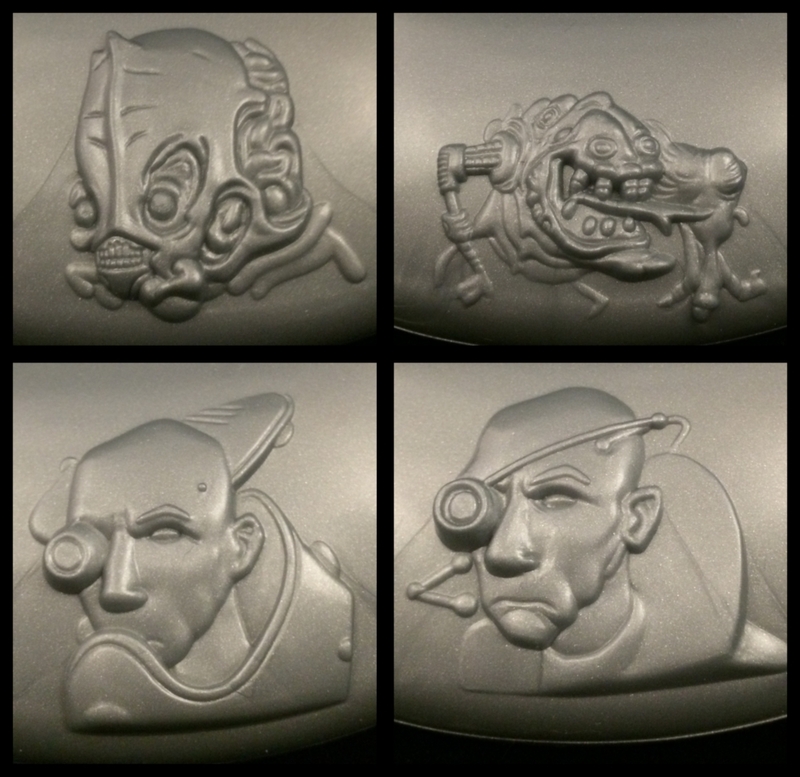 For a section of the toy that won’t be seen very much, I’m surprised at the amount to detail that was sculpted in. The upper handles (that Dwayne’s head goes between) can rotate and move a clear view screen. None of the other levers actually move, but it’s still impressive that they exist at all. It would’ve been very easy to make this an empty hole to fit Dwayne in with a sticker for all of the details. 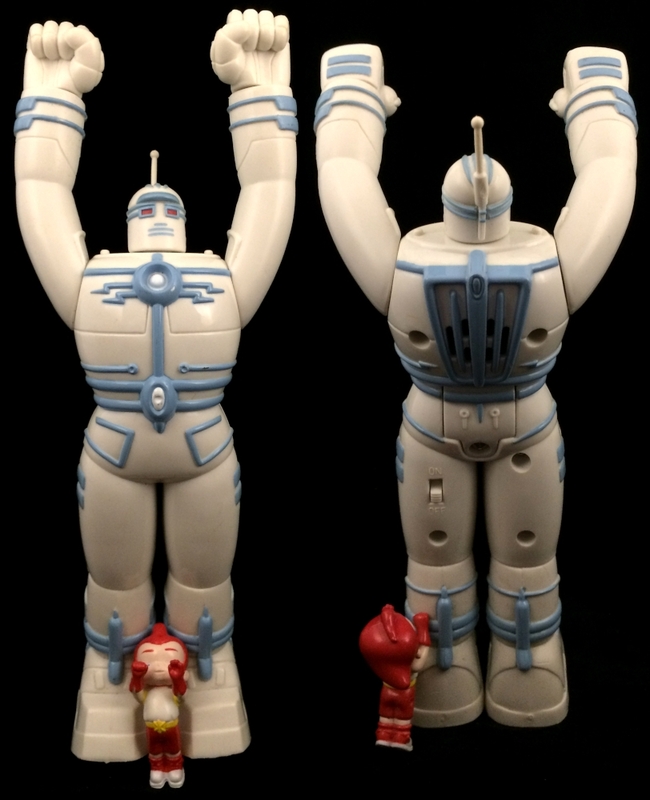 While there are only three figures in the whole of the Big Guy & Rusty toy line, you at least got three good toys. I don’t remember seeing these in stores. In fact, I don’t remember where I got the two 7″ figures (I just remember opening them). As for the Deluxe figure, I remember ordering it online (possibly ebay) back in 2001. 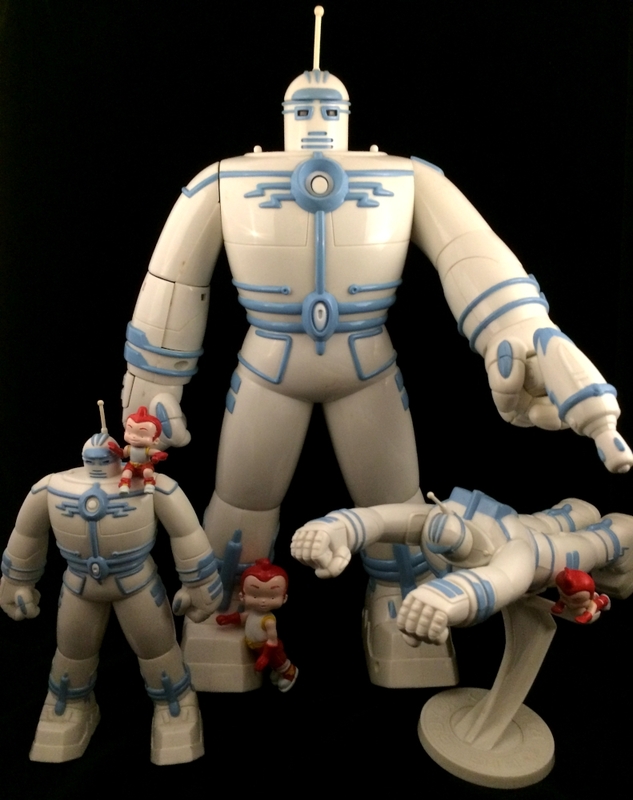 If you only want one Big Guy figure, I recommend the Deluxe version. If space is an issue, I’d get the Talking Big Guy. If you’re a little less discerning, or if you absolutely HAVE to have some more Big Guy merch, then you’re in luck! Bonus section below! 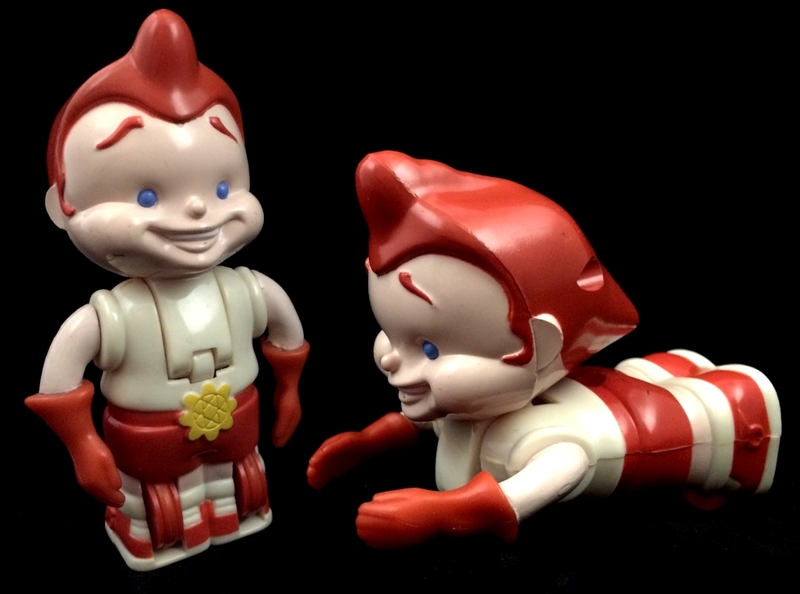 There were two different sets of Big Guy & Rusty toys sold at fast food restaurants! 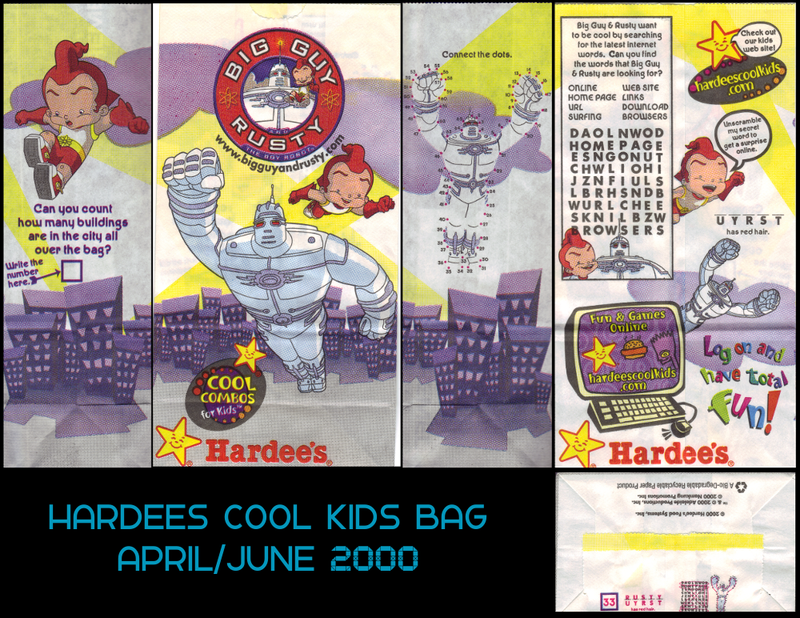 In April-June of 2000 the Hardees Cool Kids Combo featured four Big Guy & Rusty toys. The “Airborne Alien” is a flying disc. 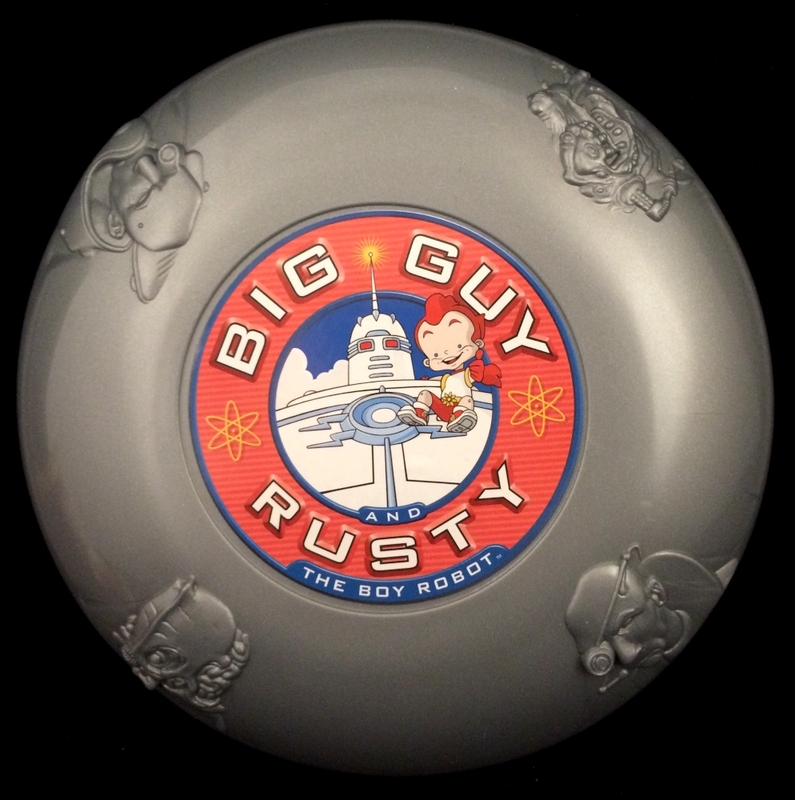 It’s got the Big Guy & Rusty logo sticker in the center and four sculpted busts of characters from the cartoon. The characters are Dr. Neugog, The Alien that rips out of Atomic Man in the intro of the cartoon, Legion Ex Machina #2 & Legion Ex Machina #4. The Big Guy Stomper is a wind up figure that has an alternating mechanism in the feet that allows it to walk, or shamble. 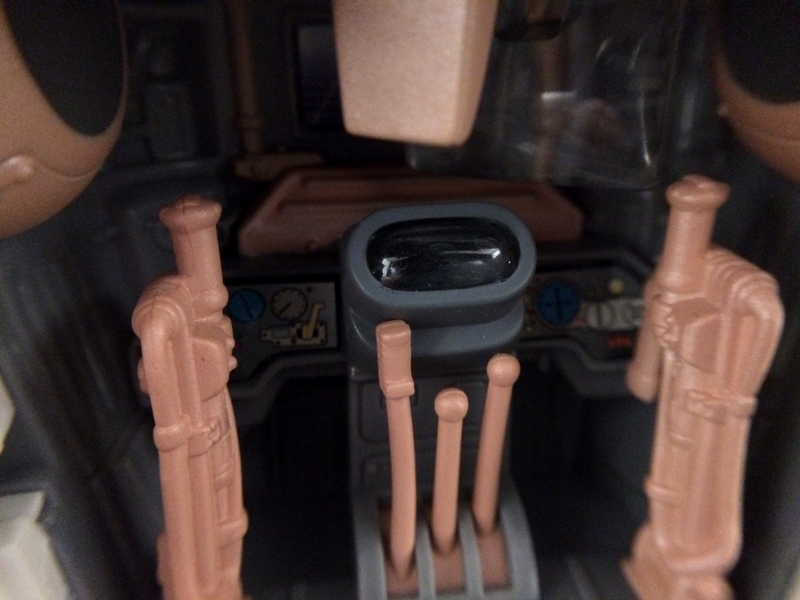 The interesting thing is that the cockpit opens up on this figure and shows sculpted details inside. 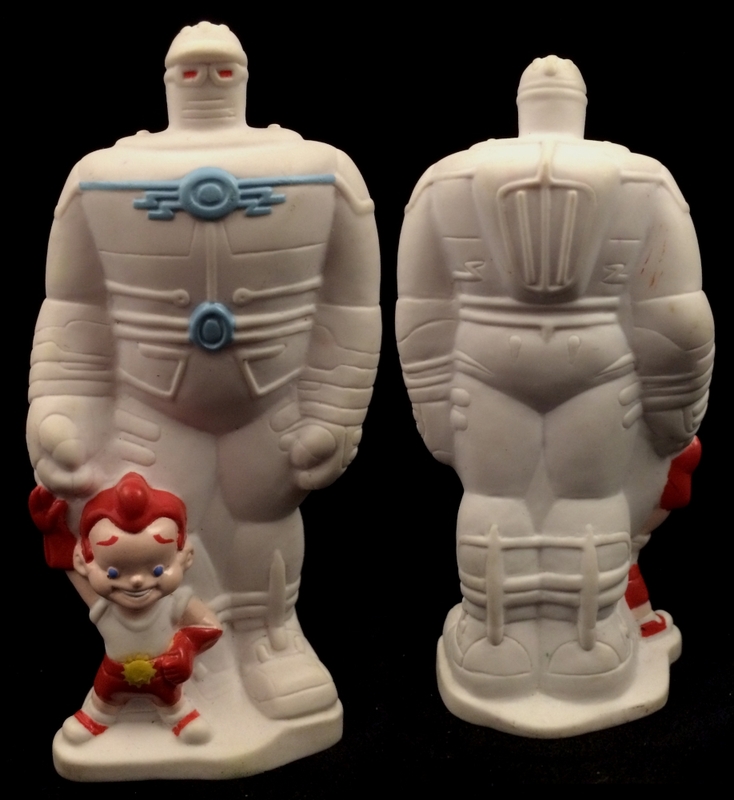 Big Guy Blast Off is basically the same Super Mario 3 toy McDonald’s gave us in 1989. You push down the figure, the suction cup holds onto the base for a moment, then the spring launches Big Guy into the air. Lastly we have Rusty’s Alien Equalizer. This is a pull string toy that launches a bladed disc into the air. 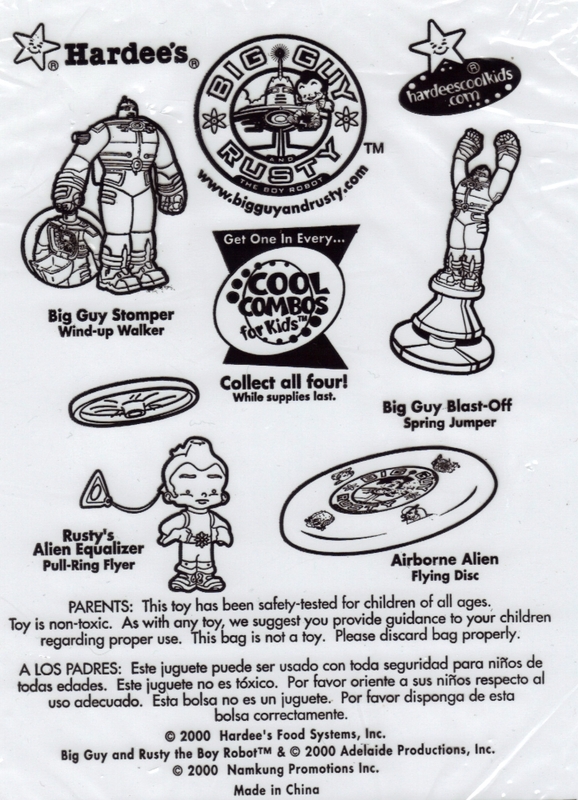 In January 2000, Taco Bell gave us a line of Big Guy & Rusty Kid’s Meal toys with five items. 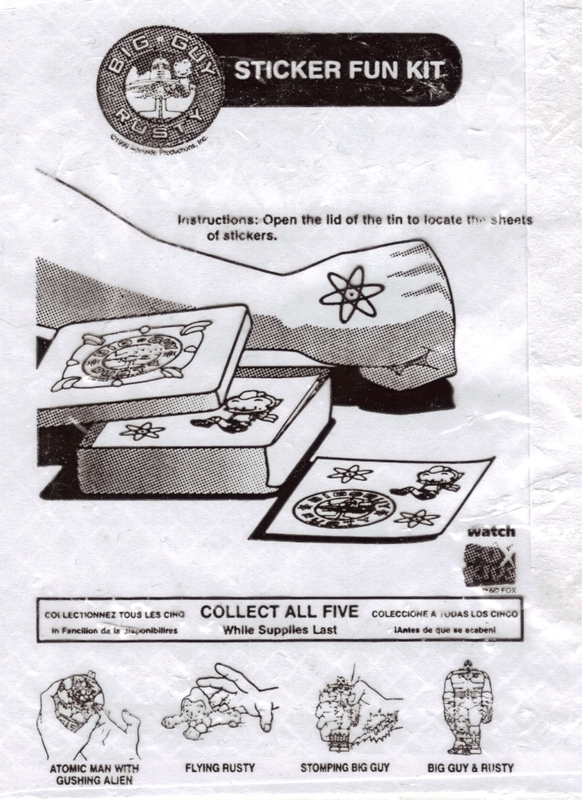 The Sticker Fun Kit is a small metal tin. Inside the tin there are 5 sheets of stickers from the cartoon. One sheet has the same logo sticker on the cover of the tin. 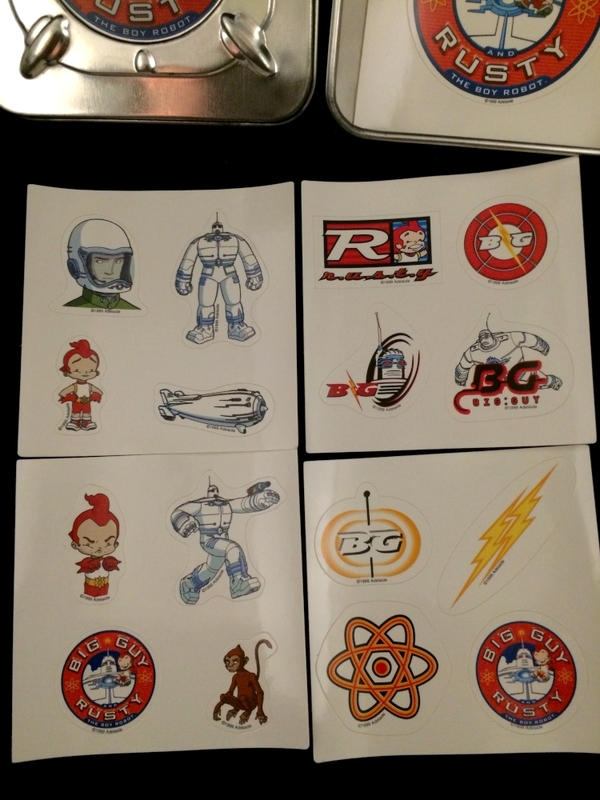 The other four sheets have small stickers of different characters (mostly just Big Guy & Rusty) from the cartoon. 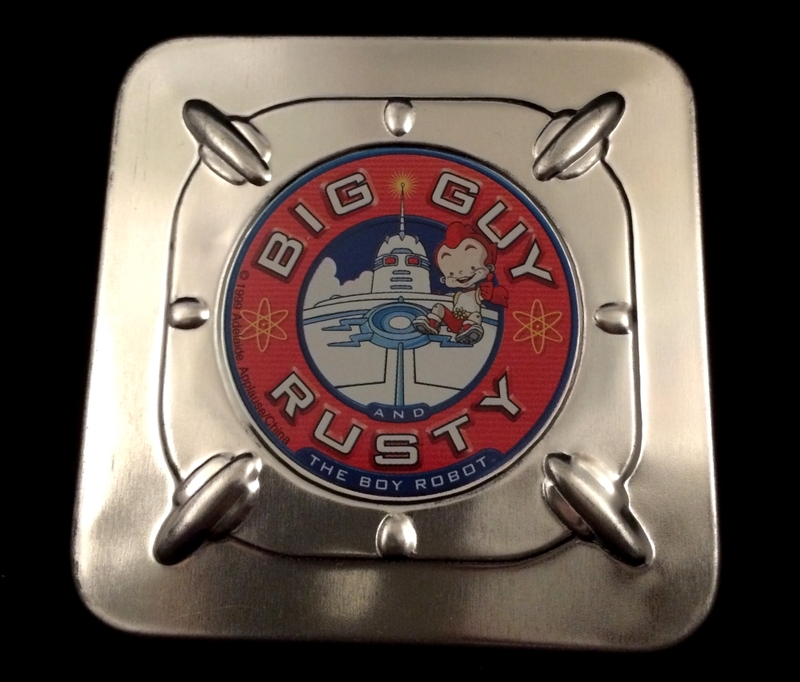 There are also a few different logos for just Rusty or Big Guy & Rusty together. Flying Rusty has a pullback friction motor to allow him to simulate flying. his is the first Big Guy & Rusty kid’s meal toy I ever got. I found it at a yardsale in 2001. 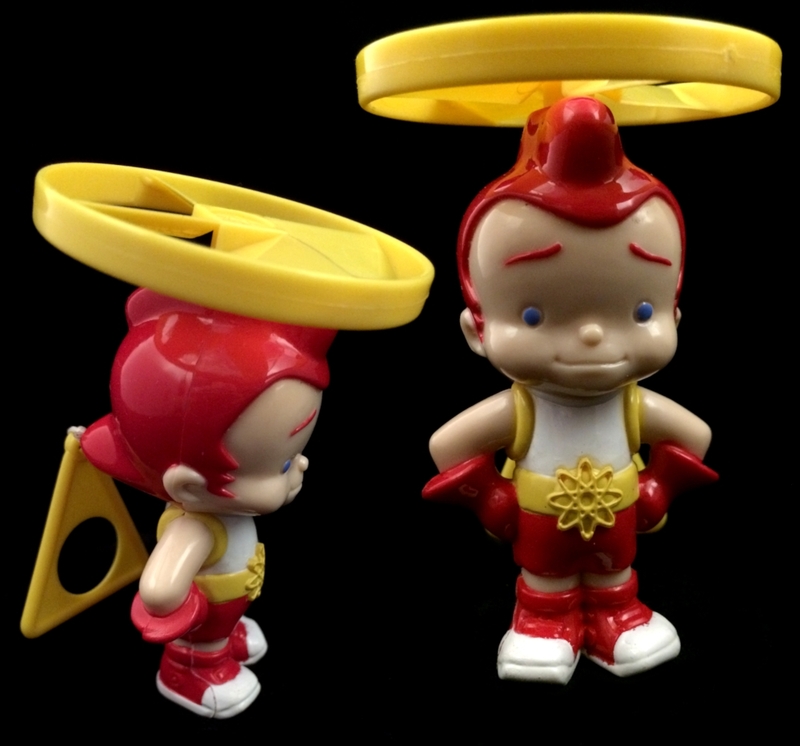 Before I found this, I had no idea there were ANY kid’s meal toys from the cartoon. 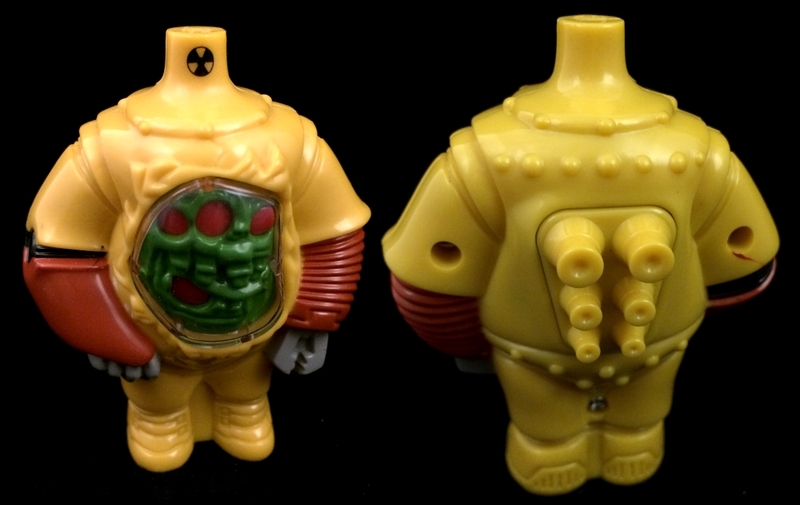 Atomic Man with Gushing Alien has a button on the back that causes the red parts on the inner alien to bulge outward. It’s similar in theory to the squish heads with bulging brains and eyes you see every Halloween. The Atomic Man is seen in the intro to the cartoon, but I’m not sure he appears anywhere else comic or cartoon wise. 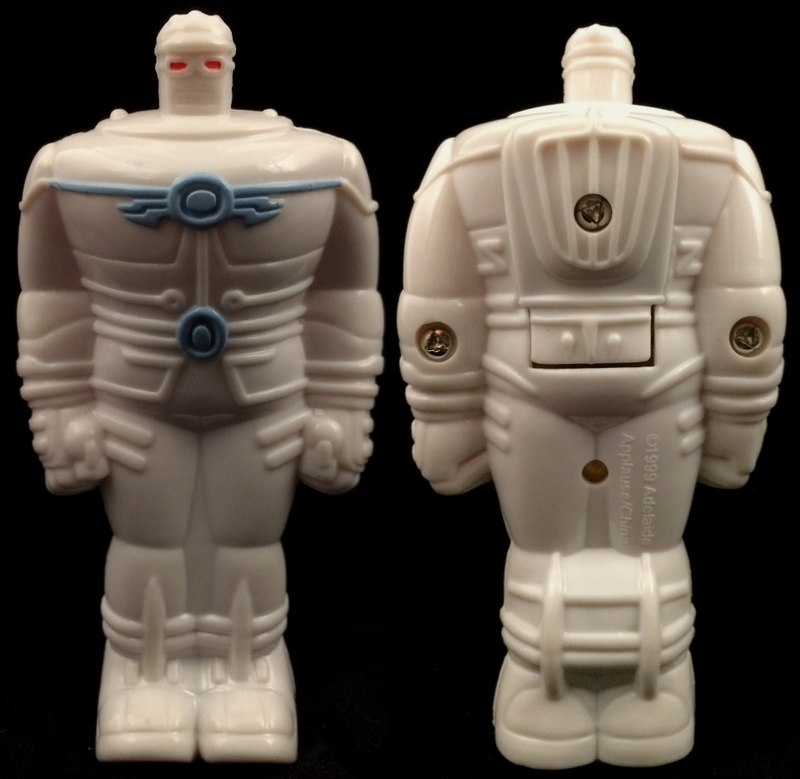 Simply labeled as Big Guy & Rusty, this toy is a hollow vinyl statue. It has good details and some paint apps. 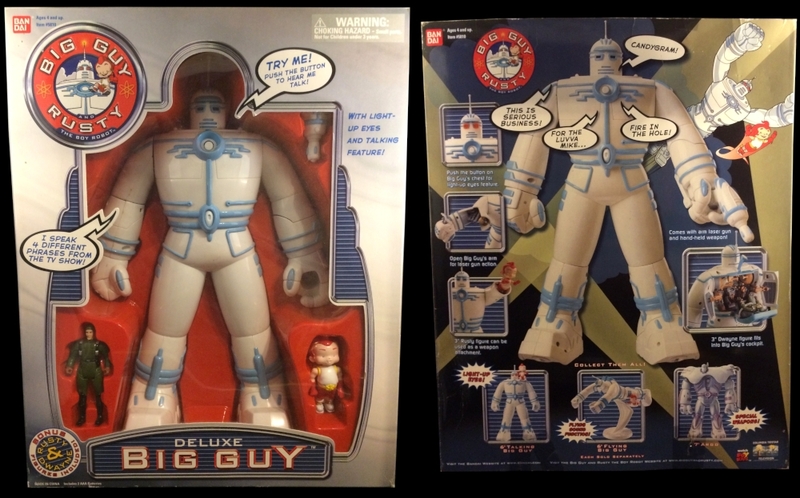 The last of the Taco Bell toys is the Stomping Big Guy. 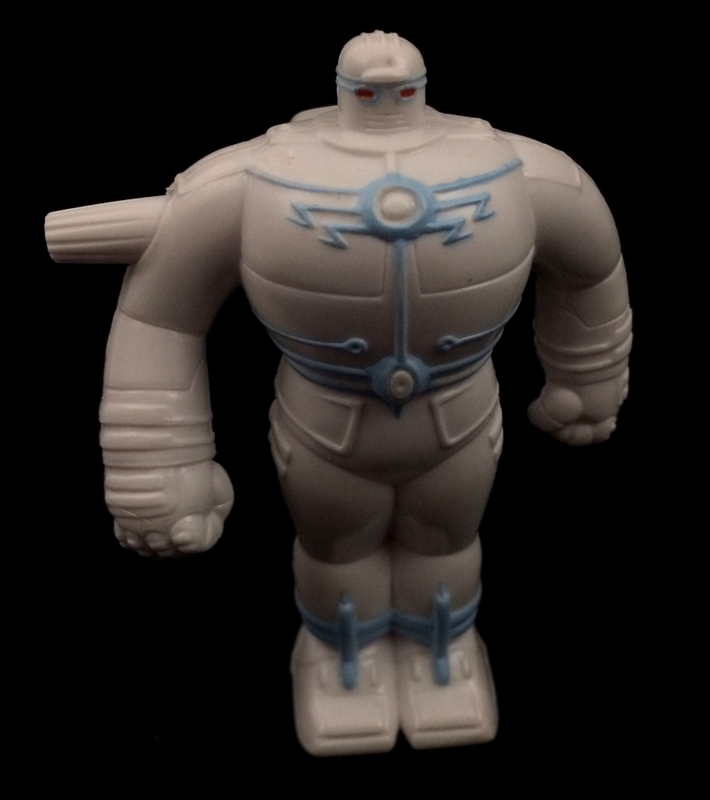 This figure has a button on the bottom of his feet that makes an electronic explosion sound when you press the figure down. The name is very similar to Hardee’s Big Guy Stomper toy. Just like that figure, this one also has an opening cockpit. This time there’s a Lt. Dwayne Hunter inside! The Stomping Big guy was the last Big Guy & Rusty toy I bought for my collection. As far as I know, this is all of the toys ever made for Big Guy & Rusty. 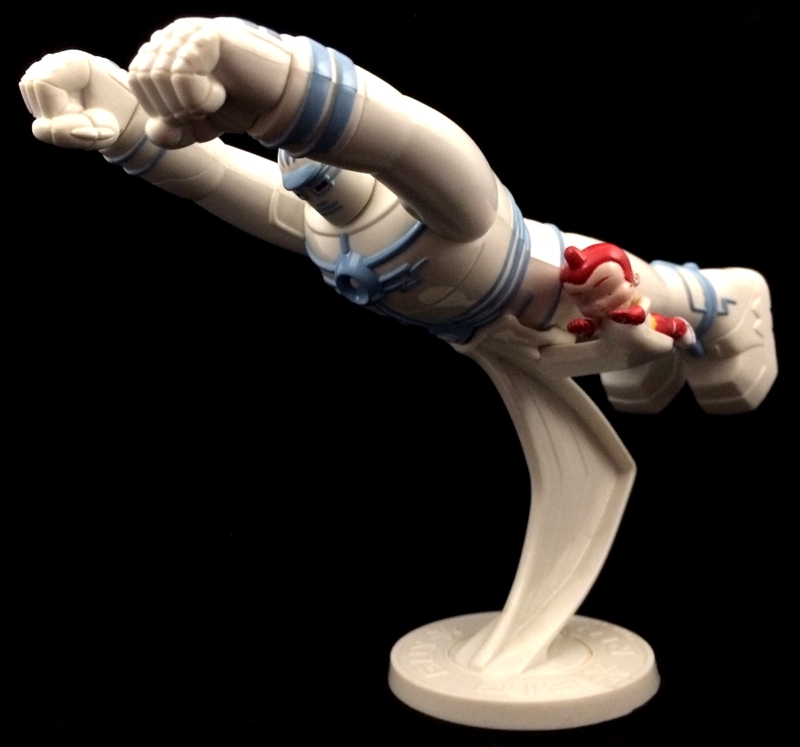 I know there’s a resin statue, puzzle and Halloween masks of both title characters, but I think that’s it for non-paper merch. If you know of any others please let us know. I would LOVE more Big Guy toys!